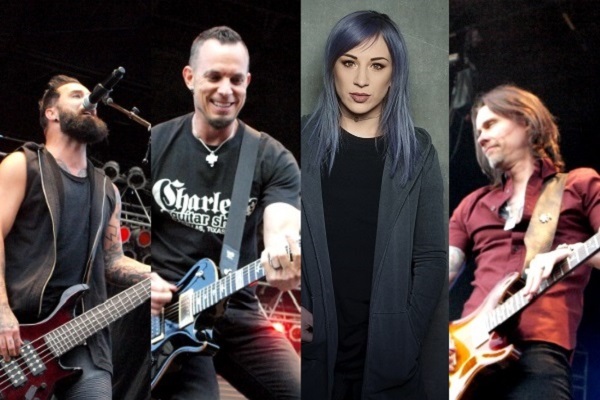 Get ready to say farewell to 2018, and as the year comes to a close, it’s time to look back at the best rock and metal songs from this chapter. With fresh music from the veterans of heavy music (Judas Priest, Slash) to newer faces (Greta Van Fleet, The Struts), this year brought a plethora of great sounds and styles. Read on for Audio Ink Radio’s Top 15 Rock and Metal Songs of 2018, and let’s get ready for more solid tracks in 2019. English rockers the Struts have enjoyed a hot couple of years, from touring with legends Foo Fighters to performing live at Victoria’s Secret’s annual holiday fashion show. With the guys gearing up to release a sophomore album, it’s safe to say that all ears are on the Struts. “Body Talks” captures their fun, glam style. Three Days Grace scored another chart-topper in “The Mountain” off their 2018 release, “Outsider.” The song marked yet another Three Day Grace No. 1 at active rock radio, proving that new lead singer Matt Walst is hardly an “outsider” anymore. Walst fits right in with Three Days Grace’s straight-ahead rock style, and fans are embracing him. Like a Storm’s latest album, “Catacombs,” set out to capture the live energy of the band. “We were definitely really inspired by all the touring we have done over the past few years—- that energy of playing live every single night,” Like a Storm’s Chris Brooks told Audio Ink of the new release. That’s especially apparent on the album’s roaring title track. With Slash keeping busy on Guns N’ Roses’ Not In This Lifetime tour, fans weren’t sure if he would release another album with his band, Myles Kennedy and the Conspirators. That all changed when Slash announced a new solo collection, “Living the Dream,” earlier this year, and the set’s first single, “Driving Rain,” is a catchy rock anthem that highlights Slash’s killer guitar work and Kennedy’s emotive vocals. Godsmack reemerged in 2018 with a shiny new album, “When Legends Rise,” and the release scored the band one of their most popular rock radio hits to date in “Bulletproof.” The song maintains the group’s heavy guitars and sharp attitude and adds some slick production that gives it a contemporary feel. Maynard James Keenan and A Perfect Circle got 2018 year off to a great start by delivering a new song, “Disillusioned,” on Jan. 1. The dark, atmospheric track carries some haunting lyrics, including “Feeding this mutation and Pavlovian despair / We’ve become … disillusioned,” and Billy Howerdel’s fluid guitar work. The rest of A Perfect Circle’s “Eat the Elephant” album is packed with more ambient, experimental rock. The guys of Shinedown always bring towering emotion and catchy riffs to their live shows, so one can say they demand, well, attention. Appropriately, Brent Smith, Zach Myers and company returned with “ATTENTION! ATTENTION!” in 2018, and they broke a chart record for the band with the most No. 1 songs on the Billboard Rock Airplay songs chart with the album’s single, “Get Up.” That said, we call the catchy tune one of the hottest of the year. Call her the Joan Jett of the modern era. Lzzy Hale and her band mates in Halestorm are mainstays in the modern rock world, and the band’s latest album, “Vicious,” is packed with boot-stomping rock anthems. The album’s single “Uncomfortable” shows off Hale’s fiery riffing and love for the guitar, not to mention those cutting vocals. It’s also worth mentioning that Hale champions women in music, which is appreciated. Metal giant Judas Priest returned in 2018 with “Firepower,” and while the album’s crisp production is certainly ear-catching, what really stands out about “Firepower” is its well-crafted songs. Sharp tunes such as “Firepower” and “Rising from the Ruins” are anthemic and edgy, with the metal sheen of years past coupled with a contemporary, fresh feel for today. The album’s title track is a real stand-out, with sharp guitars and Halford’s regal vocals. With a great mix of musical diversity, Disturbed’s latest album, “Evolution” features the spectrum of hard rock hits (“Stronger on Your Own,” “Best Ones Lie”) and more intimate, stripped-down songs (“Already Gone,” “Watch You Burn”). Lead single “Are You Ready” features the band’s classic rhythmic guitars and David Draiman’s powerful, huge-sounding vocals, and it sets the listener up for the rest of the album, which oozes with creativity and hard rock sheen. Five Finger Death Punch released a hard-hitting new album this year, “And Justice for None,” packed with the band’s beloved rock anthems and angst-y vocals. One stand-out on the album is the introspective “When the Seasons Change,” which shows the softer side of the band and enables singer Ivan Moody’s thick, emotive vocals to really shine though. To go from chugging metal tracks to a soft ballad such as “When the Seasons Change” really shows the breadth of Five Finger Death Punch. Skillet drummer Jen Ledger released her first-ever solo EP this year as simply Ledger. On the EP, Ledger takes a refreshing approach to inspirational hard rock with empowering lyrics and Ledger’s crisp, clean vocals. Lead single “Not Dead Yet” is about her struggle with panic attacks, and it certainly gives hope to many who listen. Alter Bridge unleashed a new live album and concert film this year, “Live at the Royal Albert Hall,” giving fans a totally fresh listen to the usually plugged-in band. The group filmed “Live at the Royal Albert Hall” last fall during Alter Bridge’s two concerts at the legendary London venue, and the majestic Parallax Orchestra accompanied the band at both show. The classical flourishes of a full orchestra combined with the explosive sounds of Alter Bridge’s rock is energizing– especially on the 2010 track “Ghost of Days Gone By,” which has a new feel on this set. Myles Kennedy released his much-anticipated debut solo album this year, “Year of the Tiger,” and one of the greatest aspects of the set is how Kennedy opens up and gets personal. Kennedy sings about his relationship with his father, who passed away when he was young, and it’s something to which everyone who has lost a loved one can relate. The album’s bare-bones instrumentals — especially on “Haunted by Design” — provide the perfect backdrop for Kennedy’s pure, angelic vocals to shine through. Mark Tremonti of Alter Bridge sounds as powerful and confident as ever in the lead singer role on the latest album from his solo band, Tremonti. On the album, titled “A Dying Machine,” Tremonti’s meaty, confident vocals soar over chugging riffs and heavy rhythms. The album’s title track perfectly sets the listener up for a high-energy, pummeling album, and it leaves listeners wanting more.